Learn more about Start Strong, the largest initiative ever funded to target 11- to- 14-year-olds and rally entire communities to promote healthy relationships. The month of February marks National Teen Dating Violence Awareness and Prevention Month - a month-long observance to put a stop to teen dating violence and abuse. In Georgia, a recent survey found that one in six high school students has been hit, slapped or physically hurt by their boyfriend or girlfriend in the past year. Digital dating abuse is also becoming more and more common in this generation of teens. 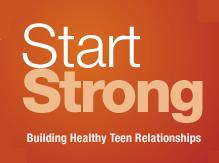 As part of an effort to create awareness around this issue, Start Strong Atlanta, a public health program focused on building healthy teen relationships and preventing teen dating violence, is spreading its message to teens, parents, mentors and the community. The Jane Fonda Center at Emory University is one of 11 community organizations nationwide to receive $1 million in funding through the Robert Wood Johnson Foundation's national Start Strong initiative. This is the largest national public health initiative ever funded, targeting 11-to-14-year-olds, to stop teen dating violence. This play will debut today then travel to other Atlanta Public Schools. The Jane Fonda Center is partnering with the Atlanta Public Schools, Grady Memorial Hospital Teen Services Program and many other local collaborators to make this four-year initiative a success. News Release: "Stopping Teen Dating Violence Before it Starts"